Does your excitement shoot up with the time ticking on your wall clock? Are you waiting for the summer to knock at your doorstep? If so, make sure voyage isn’t the only thing you’re planning. Before shoving luggage in your sheeny car, focus on your tires’ type! Yes, you’ve heard it right! You won’t like hailing taxis with your car’s burst tires under the scorching sun. 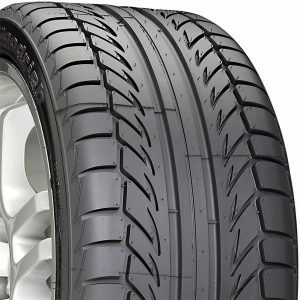 I must say that you need the best summer tires for your car to have a smooth ride in summer. Needless to say that you will have to ditch the idea of dragging your all-seasons tires through all seasons. That’s one way to extract out optimum performance from car’s engine. It is very important that you should keep good summer tires your target for perfect summer cruising. We’ve sketched the walkthrough to guide you in best performance/summer tire shopping. A ticket to impress your family with a hustle-bustle free summer trip. A good read may answer why must you go for summer tires rather than all season tires. But, I would like to introduce to you our top pick. This will help some of those lazy people to get what they want in no time. 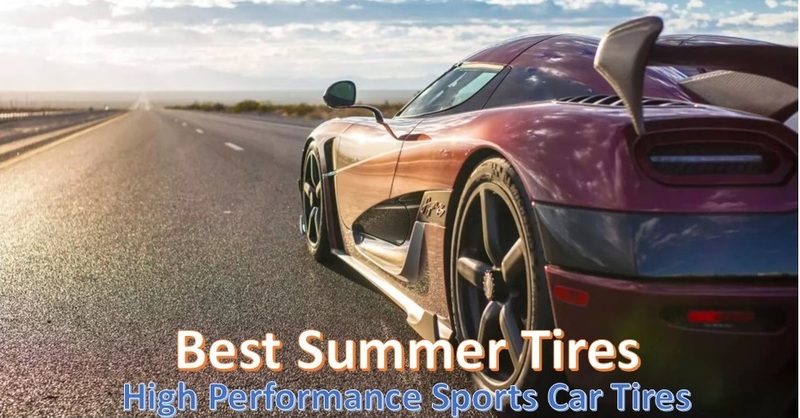 Michelin Pilot Super Sports Tire is our top pick for summer tires. This is the most rated tire in our summer tires list and 99% of the users recommend it to their peers. Customer satisfaction is the core of any business and we can bet on this product for the same. Now let us have a look at why you should use summer tires during the summer season. Do You Really Need a Summer tire? It’s normal to wonder why choose summer tires when all-season can erase the worry? Certainly, the latter doesn’t always solve the problem. Let’s support that with the following elements. All-season tires act as passionless beings, working without heart. These tires do the work superficially without taking every measure. That’s means, they don’t fit best for any weather condition. All-season tire wouldn’t allow maximum gripping. They would meet the obvious needs of all season without exhibiting premium performance in any season. What’s next? A possibility of waving “help” sign in the middle of the quiet dusty road. All-season tires would lack in the exclusive designing of treads for a specific season. This can result in compromising the performance by ignoring the tread’s design’s importance. An element crucial for channeling the water in wet planes. Proper tread designing related to seasons ensures good control over your car. You wouldn’t be slipping in the wet surface, witnessing your impending doom. The perfect designing boosts up the grip, smoothness and the control while driving. It is true that all-season tires can give a fair performance on normal days. However, they can put you at risk in extreme weather conditions. Most of the accidents occur in such situations. For example, in summer, the roads tend to get hotter. Your tire must be optimized according to the season for instant reaction. For temperature above 15 degrees centigrade, summer tires can respond to the brake faster than other types of tires. This is because only summer tires can promise a high grip level on both wet and dry roads. This is done by their special tread patterns and tread compounds. Summer tires stay softer in warm temperature to slide around on wet or dry roadways. They also provide high driving stability in curves and optimum mileage performance. It’s important to note that summer tire can have its different categories. They can range from day-to-day summer tires to extreme tires. The latter is known as “Performance tires”. Performance tires are designed for the maximum dry road and track performance. These high-performance summer tires would give the premium road trip. That is why they’re manufactured for sports cars and racing enthusiasts. To wipe out ‘Best Summer/performance Tires’ hunting trauma, check out our list below. We’ve dug out some of the high-performance summer tires along with great sports tires. A handsome tire designed for car’s speed to cheer the audience. MICHELIN Pilot Super Sport tire is excellent for both daily tasks and young enthusiasts’ games. A robust performance tire flaunting its beauty in the market with intelligent tread design. It manages smooth and healthy driving after undergoing traction and temperature tests. This tire offers 30,000 miles tread life warranty. The tire digs deeper against the road for the optimum performance grip. The technologies encompassing its built are Variable Contact Patch 2.0 and Twaron belt package. Just enough to provide the tire long even wear. The tire favors perfect cruising on street in a great price! It’s deemed as the rival of Pirelli’s Zero. However, it guarantees top performance in dry braking and handling. This Michelin tire has a LeMans-inspired compound on the outer shoulder with wet-oriented elastomers on the inside. A pleasing package for car enthusiasts for summer adventure beneath the hot sun. The tire keeps up the promise of giving a quiet and comforting ride. You can venture into your car with techno music buzzing out of a window. The speed would then best match the music. Able to perform well in wet conditions. This means this tire can survive the rain smashing on the highway. Numerously Listed as one of the most popular and best high-performance summer tires. The tire needs to have a high temperature for a proper grip. That is, it requires prior wheel spinning and sliding. These tires are perfect for summer outdoor long drive adventure. It’s built with the latest technology to provide ultra-high-performance tire. It indeed gives a good dry and wet grip. However, the tire would require a warm-up for working at its best. One of the most technologically advanced tire-making its way to the market with the new design. A max high-performance tire, aiding in powerful speed. This all-terrain tire is compatible for your jeeps, light pickups, and even SUVs. It provides high-density sipping to ensure better resistance to hydroplaning. Pirelli’s P zero is guaranteed to make your car buzz around with perfect speed and smoothness. It provides a good control over your vehicle in wet conditions as well. This is done by the tire’s circumferential grooves for straight-line traction. It offers high-speed stability with the support of Coupling joints to reduce tread flex. Traction and temperature are graded as highest with AA and A respectively. A good reason why these high-performance tires are used in luxury 4-wheelers. It incorporates staggered shoulder lugs for supreme all-terrain performance. Something that adds it to best summer performance tires list is its traction feature. What stands it out? There aren’t many tires beating Pirelli’s P Zero to attain maximum summer traction. Offers very smooth drive. A great deal for going on a calm night drives. Provides excellent dry performance and good wet performance. Doesn’t bear noticeable noise throughout its lifespan. Reliable for hard braking, hard cornering, and speed driving. Provides displeasing bump-steer and jerk as a reaction to smaller bumps. Pirelli’s P Zero accentuates the engine’s potential. It gives a thrashing speed along with great ride and handling. It, however, isn’t acceptable when the temperature falls by many degrees. The tire doesn’t provide longer tread life. However, it’s perfect for people hunting for ultra-high-performance tires according to seasons. A tire, promised to bring out the best in sports enthusiasts. Designed for diversified wheels rolling over highways and street. This sporty beauty is BFGoodrich’s best high-performance summer tire. Designed to ffulfillthe needs of racing enthusiasts steering their cars at wild speed. It corners harder and breaks instantly in both dry and wet conditions. It’s maximum corner power and tested stability credit intelligent tread pattern. The tire’s Solid Center Rib remains straight even while encountering rough roads. To obtain a great response for grip limit, shallow shoulder blocks have a racing-exclusive design. The tire uses a silica-infused COMP-2 compound. This enables excellent steering response without surrendering treadwear. The g-Hooked tread design facilitates biting edges for optimum grip. These tires work both on wet and dry condition. Thanks to the broad circumferential rain channels responsible for dispersing water. A trait essential to counter hydroplaning and increase wet traction. Excellent lateral traction with a greater number of bites while cornering. Good steering response. Allows daily cruising in your metallic cars for a quick grocery run! Budget-friendly summer tire. You can rock the road with these tires without losing your savings. Not to mention you can always brag about these in front of your vehicle squad. Extremely impressive on wet roads. Traction falls off linearly as the tire passes to its old age. However, its noticeable after at least one year of use. These tires provide sufficient traction to hinder summer road problems. Excellent choice if you own Sedan, Sporty coupes or modern sophisticated cars. Their intelligent designs cater to high functioning steering, grip, and high performance. 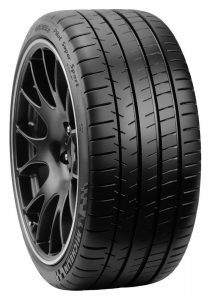 A Hankook’s maximum performance summer tire, engineered to accustom the high-performance and sporty needs. For this guy, let’s dig up the reason for its place in great performance tires. One out of others is its ability to maintain high grip. It sustains its appreciated grip even as the tire slides on the street. It introduces itself in the market with premium handling and outstanding traction. Turn on the radio with AC throwing cool breeze on your face. You can notice the comfort and control optimized for dry or wet condition. The tire votes for high-grip silica tread compound that incorporates styrene polymer. Its functionality is to minimize the rolling-tire’s resistance. With this trait, comes a celebrated victory. Low rolling tire resistance vouch for accentuated fuel economy without sacrificing wet/dry traction. 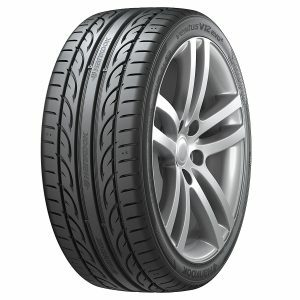 The tire’s compound is designed to offer dry handling and traction. This is done by using top-notch directional tread design. The tire also has impressive channels for dispersing the water for hydroplaning resistance. The credit goes to the Conferential and Aqua Jet Lateral grooves. Excellent dry grip as compared to the price demanded. For a quick direction change, the front end of the tire starts washing out. This tire is suitable for spirited drivers looking for a decent-daily use. It’s a budget-friendly tire ready to flaunt on the pavements. It is however advised to rotate the tires often to invest in its tread life. Make sure to check for its alignment and keep the pressure correct. An asymmetrical tread design tire with the brilliant combination of performance, touring and traction. This performance tire knocks at people’s doors who’re looking for economical tires. It gives a smooth ride in half the price of premium tires. The functionality remains somewhat identical. Good part is its enhanced steering capabilities and strong ‘outside cornering force’. This is supported by its rigid shoulder patterns. Circumferential grooves and angled tread blocks increase wet traction and appropriate handling. This performance tire holds up an acceptable all-season driving performance. It’s because of the asymmetric tread design. It tends to let drivers enjoy their trusted partner tire over a long period. Provides beautiful, quiet and comfortable ride. The tire gives off sporty vibes with outstanding traction. Budget friendly tire. Among the cheap summer tires. Impressive wet and dry grip. Little sliding around corners on harsh driving. The tire is suitable for people not the fan of ‘empty wallets’. With advised care, the tire can hit the road over longer lifespan. It can give you a peaceful and comfortable ride with a noticeable grip. It’s no biggie to curl up on your couch, battling the shopping dilemma. Perhaps swapping between the all-season tires and summer tires tabs in your cell phone. Maybe to get insights about highlighted differences between summer and all-season tires. To wipe away your doubts, we’ve packaged a difference table. Let’s put these tires on board to get into summer wars! Following table highlights dominant traits for heated “Summer Vs All-Season tires” debate. All-season tires provide acceptable performance in both wet and dry condition. They have integrated capabilities for the ease of use throughout the year. Suitable for places that have moderate weather conditions. However, their performance is more of a compromise than a perfection. Great summer tires can be stated as ‘ultra-high-performance tires’. They are designed for optimum speed and agility. Their outmaneuvering speed and smoothness pass these as sports tires as well. All-season tires are manufactured to be used throughout the year. 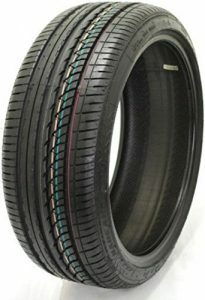 Therefore, they have moderate tread depths and rubber compound. This feature is established to provide longer tread life. Summer tires incorporate shallower tread depths. This ensures higher stability when exposed near their thresholds. However, they wear out sooner than All-season. They provide less grip as compared to summer tires. This factor emerges out as the murderer for high-performance capabilities. For example, steering, braking, and cornering. However, this compromise is essential for acceptable performance in light weather condition. These tires have specialized tread patterns and rubber compound aiding in great steering, braking, and cornering capabilities. These patterns bear less grooving while establishing more contact of rubber with the road. 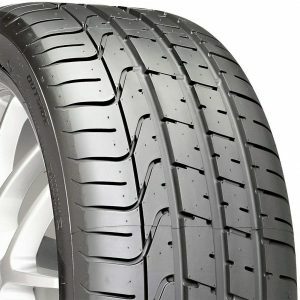 Their intelligent tread design provides maximum grip and traction with flexible tread compound. One good thing about All-season tire is that they provide traction in cold weather. However, not effective in extreme winter condition. If your tire is prone to icy/snowy streets, switch to snow tires. Summer tires are engineered to be softer in warm weather. However, with the decrease in temperature (during winter), the rubber hardens up. This suggests the loss of grip in winter. That means these are unacceptable in low temperature. All-season tires are cost-friendly, designed for normal drivers. Summer tires or high-performance tires are designed mainly for boosting up the speed. Also for the best experience in summer. This, however, also requires emptying your wallet a little. Summer tires are built with millions of dollars spent on perfect design. They can be costly in terms of switching between different tires for other seasons. If you’re wondering about crashing on tire shop, ask yourself first. Can you tell the difference between good and poor tire? Are you able to verify its worth? If not, don’t worry! We’ve promised to walk you through the tips for buying the tire. Read away this section, slouching on your couch to always get high-performance summer tires. Before thinning your wallet, check if you really need to buy a new tire. Typically, the manufacturer would recommend replacement after 6 months. However, you can always prompt open your tire’s instruction manual. Check if you’ve dragged your tire for long. Next. Drive to your mechanic to have him inspect your tires for wears and tears. Alternatively, you can spare a long drive by checking on your own. Trace your fingers on your tire to spot any cracks or distortion. The pressure inside the tire leaks through the tiniest holes. It is good to use some of the accurate pressure gauges for this. If you detect the grooves, that could be the sign of future leakage. Weak outer surface indicates a possible displeasing tire emergency. The bulges on the tire often speak for the weaker surface. Suppose you’re voyaging in your car with happy music beaming inside. Wait! Did your car just jerk out a noticeable vibration? If so, it’s time to replace these tires. Otherwise, you would be waiting for a human’s lift on spooky roads. A sad song playing on your cold earplugs. A common trick as advised by many is placing the coin into treads or grooves. Can you see the head (if you placed the coin upside down)? If yes, your treads are worn out and demand the replacement. Refrain yourself from buying the tire intuitively. Check the size that is in the car’s manual. The new tire must match this size instead of the previous tire size. You need to have knowledge related to tire specific terminologies. This is to check if the tire is suitable for you. We’ve highlighted some of the very basic ones. Get to know the construction and speed ratings. The latter ranges from grad A to Z with A being lowest. Higher grade means high speed, handling and control with possible shorter tread life. The speed rating should be compatible with your car’s model. It verifies whether the tire manufacturer meets the U.S. Department of Transportation tire safety standards. A test designed for grading a tire’s tread wear, traction and temperature. Each tire has its own age code. It follows a DOT having 4 digits with 2 digits indicating weeks. The other two tell the year. Age code could be used to estimate the expiration date. This is because of ‘replacement after 6 months’ advice. This is necessary for checking if the seller is tricking you into buying the old tire. You should understand the Warranty before exchanging the tires with a huge amount. Many manufacturers would flaunt the warranty in terms of mileage. However, most drivers argue about not seeing their tires surviving till promised mileage. The chances to get that mileage is even lesser for heavy vehicles. You don’t necessarily get new tire by the manufacturer in that case. You need to prove that you properly cared for the current one. This care requires proper infiltration of the tire at the correct pressure. You also need to align and rotate it every 5000 to 7500 miles. Even then, the warranty is offered after proper inspection of service records. Here is a comparison table of all the top rated summer tires to help you choose the perfect one. All-season tires can work for many drivers for a whole season. However, they don’t fit best for any season. Summer tires showcase optimum performance of your car’s engine. These tires also block emergency situations in heated weathers. They’re responsible for giving your car a sporty persona. For the perfect summer trip, select from the best summer performance tires we’ve mentioned.